Catholic Icing: St. Nicholas Movie Giveaway from CCC! St. Nicholas Movie Giveaway from CCC! Nicholas was only a boy when he discovered something life-changing: Giving to others brought happiness to many people. Although his wealthy parents died during his childhood, Nicholas fully embraced the Christian principals he was taught and spent his life and inheritance helping the sick, suffering, and needy. In doing so he faced many dangers and endured great persecution for his faith. 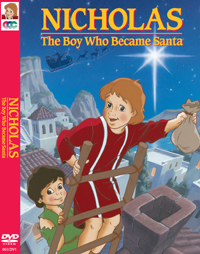 Nicholas: The Boy Who Became Santa is the award-winning animated film based on the historical facts and traditions of Saint Nicholas. It is the inspiring story of a Saint whose exemplary faith, love and care for others continues to impact society more than sixteen centuries later. One of the most popular figures of all times, the entire world still celebrates the kindness and generosity of the man we call Santa Claus. This beautifully animated story is a perfect gift for Christmas, yet a film worth watching all year long! For your first entry, leave a comment below and let us know what your family's favorite way to celebrate St. Nicholas day is! For an additional entry, go and "like" CCC on facebook - then come back and leave an additional comment letting me know that you did. Entries for this giveaway will close on Sunday December 12 at 11:59pm. If you don't have a blogger profile, please leave your email address in the comments so we can contact you if you win. Maximum- 2 entries per household. Good luck! We watch St. Nicholas the Veggie Tale movie and put our shoes out under the Christmas tree the night before. The kids told me their favorite thing about St. Nick's feast day is coming downstairs and looking in their shoes! I "like" CCC on facebook, too! We're excited about the chance to win the DVD. 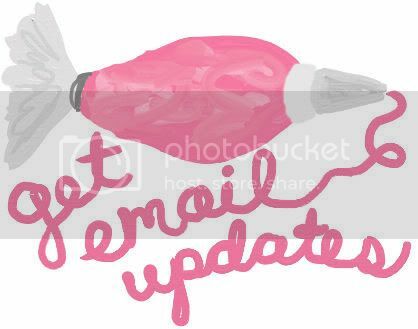 Oops and my email address is brittakreps@hotmail.com! Happy Feast Day! This will be our first year doing anything with St. Nicholas Day. We'll be putting up our tree tonight. Without children yet it's simply going to be a time to enjoy our time together and start a file on St. Nicholas Crafts and Ideas for later! We put our shoes out last night. This is the first year we have done it with my 4 year old. He was thrilled. It would be wonderful for him to see this movie and understand St. Nicholas's life better. I love the Blog and a fan on Facebook. Thank you! I liked CCC on Facebook! I liked you, too. I didn't know I could do that! :) Happy Feast day! Just became a fan of CCC on Facebook. Thanks again! We have never celebrated St Nicholas day before, but would love to learn more about it! My husband and I are new to the Catholic Faith (we were in RCIA last year) and are learning and sharing with our 4 girls. I am so thankful that I found your blog, so that I can share your ideas with my daughters! St. Nick typically gives Christmas pajamas and slippers to each of the kiddos and of course some candy. We leave our shoes out and find them filled with gold coins, fruit, cookies and a toy! We also read about St. Nick and usually have a special breakfast. I like CCC on Facebook too! Awesome giveaway, thanks! We are baby stepping our way into Advent (the 3YO and I... Hubs is Protestant) and so I'm thinking there will be a coloring page in our day today. Perhaps I'll pick up some belated chocolate coins at the dollar store (if I can find them!) and use Jessica @ Shower of Roses's St. Nick circles. I am a fb fan - thanks again for the chances! This is actually our first year of St. Nick in OUR home! We spent the entire week before watching St Nick movies and then a shoe was put out for him! ALTHOUGH I did grow up with him and my most memorable St. Nicholas day was my freshman year of college....shoes were sitting in the hallway of our dorm (to avoid getting the dirt into our rooms) I woke up that morning to my shoes filled....and I moved an hour away from home for school! Our favorite way to celebrate is to set out shoes. It's also my third child's name day! 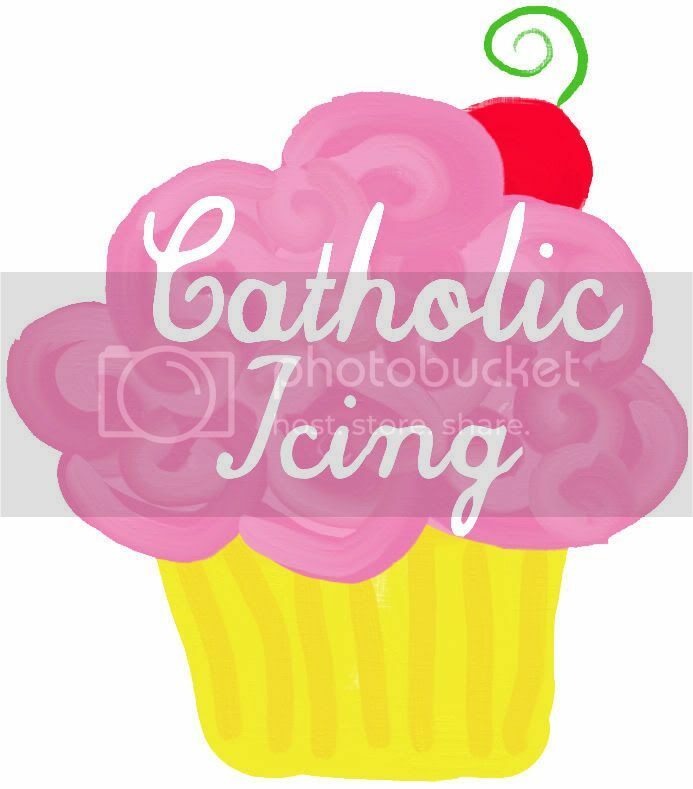 We are big Catholic Icing fans! And we love CCC. My son's godmother usually gives him a DVD every Christmas, but we do not have St Nicholas. My six kids put their shoes out last night and woke up to a huge gold chocolate coin and Twizzlers! Happy Feast day! We do the majority of our gift-giving today. When Christmas comes, we find ourselves less stressed out and more able to focus on Jesus. We do give some gifts on Christmas - like candies or homemade gifts; and receive gifts from Grandparents, etc. We liked CCC on Facebook! We actually don't have any St Nicholas Day traditions yet. I'm a convert and didn't grow up with it and hubby didn't do St Nicholas either. So we are looking for ideas for our 4 kids! I used to show all these movies when I was a 3rd grade teacher. They are so effective! After watching the St. Bernadette movie, a TON of my kids started praying a rosary during recess time. I want to start collecting these for my own children! PS: I "like" CCC on facebook! We pray together and later in the afternoon we go to our friend's house and have a St. Nicholas Party with cookies and goodies. We leave the shoes under the children's beds and leave fruit and a bit of candy. They can have their fruit and treat in the morning with breakfast and look forward to Christmas with one more way to get into the Season of Advent and Christmas. I just "liked" CCC and Catholic Icing on FB! 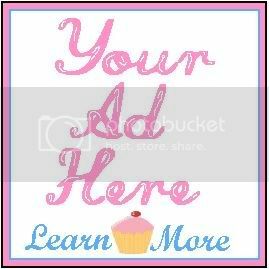 :-))) My email is LMBMommyof4@comcast.net. Thanks and Happy Feast Day of St. Nicholas! God bless! The girls get their stockings filled on St. Nicholas day and today we are going to read "The First Christmas Stocking" by Elizabeth Winthrop--a touching picture book about how God is never outdone in generosity. We celebrate by reading about St. Nicholas, making St. Nicholas gingerbread cookies and most years have a visit from St. Nicholas with our HS group. The children love recieving items in their stockings as well! We would love to win! We left our shoes by the front door next to some newly colored images of St. Nicholas from the Saint Nicholas Center website - it was exciting to see the kids dig for goodies this morning! This is the first year we have really celebrated St. Nicholas day because our daughter is just now old enough to get it. :) She was so excited this morning to find chocolate gold coins and Christmas pajamas in her shoes. We put candy in the kids' slippers while they're sleeping. My five year old was so excited this morning when she realized that St. Nicholas had visited. I just liked CCC on Facebook. St Nicholas always leaves my kids little Christmas stuffed toys. Now with 6 kids, we have TONS of toys!! Thank goodness for after Christmas sales!!! I liked CCC on FB!!! St. Nicholas leaves chocolate coins in our shoes here. Then we have crafts, games, and movies about St. Nicholas. We're just about to watch this CCC movie, but ours is VHS so I hope we win! Thanks for your blog and the chance to win. PS. I like CCC on Facebook, too! We leave chocolate coins in our childrens shoes. We put our shoes by the front door, and St. Nick filled them with candy canes and new pj's for everyone! I can honestly say this is the first year we have celebrated St. Nicholas day. The kids have done stuff at school, but never at home. It was kinda fun leaving our shoes out last night. I am a facebook fan! Love your site, and have been sharing it with friends! Our parish has a breakfast for families at which we are visited by Bishop Nicholas and can have our pictures taken with him. At home our kids set out their shoes for gold coins, a small gift, and perhaps a prayer card or personal note of encouragement from the good bishop. And I like CCC on Facebook too! We read "Saint Nicholas" by Ann Tompert and put out our stockings last night. I love the CCC movie. I grew up watching it as a kid and hope my children will enjoy it as much as I did. Shoes and telling of the story along with 3 golden balls that will go on the tree. I just added CCC on FB. Thanks again for your website and all the fun fantastic encouraging ideas. I would love to win the St Nicholas movie! We need to build up our CCC DVD collection. We had a number of CCC VHS movies for our older kids and now my youngest are watching Scooby Doo! I would love to add this video to my CCC collection. We celebrated St. Nicholas day yesterday in our homeschool group so that the dads could be there. Started off with Gingerbread houses lead by the team leaders (the dads!) and then made St. Nicholas ornaments, sang songs of St. Nicholas and the good ole saint even came for a visit!! Watched the CCC video and finished everything with the PM Mass! What a great St. Nicholas day celebration! this was our first year to celebrate the Feast of St. Nicholas! We put our shoes by the door, and he left Reese's peanut butter Christmas bells =) The kids really enjoyed it! We celebrate by putting out shoes and they arew filled with chocolate gold coins and an ornament for each child. 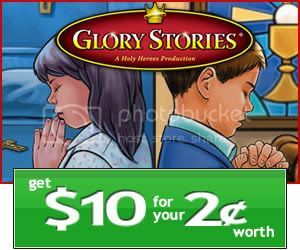 We also have a celebration at our church and St. Nick visits while the older kids tell his story. They kids alos do St. Nick crafts. I told myself this year I would remember to do something! The day is not over....but I have no idea of what to do! My son Nicholas left his flute home this morning so after I find it I will have to drive it up to school. I think I will bring him a special treat as well! Our favorite way to celebrate is with St. Nicholas stocking gifts and the story of St. Nicholas told by our St. Nick puppet. This year we gave the kids socks in our of the saint who put coins in stockings... :) They also enjoy the coloring pics we've found here and through other sites. I make the bishop cookies that look just like the St. Nick cookies in "The Baker's Dozen" book. We always watch our VHS version of this CCC video too. We'd love a DVD as we are nervous because our VHS player is rather sickly :-) Thanks for the chance! We had our shoes out last night and this morning everyone received a new DVD to watch for family movie night and a new book. Our shoes were filled with gold choc. coins and a note from St. Nicholas telling us ways to improve our behavior during Advent. I like CCC on FB too! Thanks again! I love your blog! Just "liked" CCC on Facebook. Their DVD's are wonderful. This movie on St. Nicholas is really good. I think they did an excellent job conveying who St. Nicholas was - it is not watered down. I have a number of copies in my office. This morning our kids opened a couple presents from St. Nicholas. It's fun to see the joy on their faces. Yesterday Bishop Nicholas dressed up in my son's Sunday school class and my son thought it was the Pope (he's 3). This is the first year we're celebrating St Nicholas. Think we'll decorate the tree tonight. I forgot to put shoes out this year, so we'll just be watching the Veggie Tales St. Nicholas DVD - and next year we'll resume the "candy in the shoes" tradition! liked ccc on fb. grew up on their stuff. love em! I also "liked" CCC on Facebook! I like CCC on fb also, Thanks! Today was our first time celebrating it. My son is 18 months old and I put out all our shoes ant put chocolate St. Nicholas' in our shoes. He was pretty excited and keeps looking in his shoe for more! I like CCC on FB! My husband loves these videos! My favorite part of our St. Nicholas festivities is reading The Baker's Dozen, which is one of my very favorite Christmas books. We had chocolate in the shoes this morning and some little car-shaped books. Oh, and half-eaten carrots by St. Nick's donkey. We read St. Nicholas the Real Story of the Christmas Legend and colored a stand up St. Nicholas paper doll. There were also gold coins in their shoes. Tomorrow we are meeting with friends for a party. I like CCC on Facebook! We fill the kids stockings up and then today we colored some St. Nickolas pictures and we'll talk about him a little. My kids are still pretty little. Hope you all have a great feast day. For our first St. Nicholas day the kids woke to find chocolate gold coins, a clementine, a candy cane pen and St. Nicholas chocolate Santa and coloring pages in there shoes. Tonight after we do the advent wreath and Jesse tree I will read them 2 story books about the saint while we drink a cup of hot chocolate, (a recipe I got from Jessica at Catholic Cuisine.) I think we are off to a good start at creating a nice family tradition for Saint Nicholas Day. Thanks for entering my name. Our family decorates the breakfast bar with St. Nicholas statues that we have been gifted with over the years, and each child receives a surprise from St. Nicholas on their breakfast plate. In the evening we read books that we have collected about St. Nicholas. Our prayers for the day include St. Nicholas. It is a feast day that is one of our family's favorites! We put out shoes the night before in hope of treats. This year, St. Nick visited our church playgroup and left tangerines, 2 gold coins and some smarties in each pair of shoes. We also colored a coloring page, glued together our own holy cards, and we will watch the Veggie Tales movie abotu St. Nicholas. 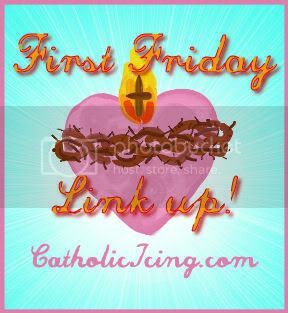 Thank you for all the links you put together for the Feast. I also liked CCC on FB. My children put their shoes by the front door & this year my almost 3 year old son received a toy dump truck (close to his heart) and my 1 year old daughter received some balls to play with her giant gum-ball machine. We put out our shoes to woke to find fruit, St. Nick coins, and nativity themed ornaments. We celebrated in the morning with a special breakfast as we read Tomi dePaola's County Angel Christmas! I liked CCC on Facebook, too! We put our shoes out too. Plus we've been opening a picture book each day of Advent (mostly wrapped library books, a few our own). Today's was about St. Nicholas. I'd love to add this to our collection! Thanks for the chance! We have small gifts in our stockings and learn about St. Nicholas by reading different books. We didn't get around to it this year, but food is also usually a big part of the day. This was our first year celebrating St. Nicholas Day. St. Nicholas set up our Little People Nativity scene where my 2 year old would see it (and have access to it). He left her shoe filled with treats (holy cards, candy, and a little necklace) right near the Nativity. She loved it! Our kids leave their shoes out and St. Nicholas puts them away and leaves new slippers in their place. Always with some gold coins-- of the chocolate variety. The girls all try to do something nice for someone in secret on his feast day. Today they drew pictures and brought a little surprise to hide on their teachers' desks. We do our stockings on St. Nicholas Day. Our son was so excited to come downstairs this morning. while he liked the little toys and gold chocolate coins, he was most excited about the oranges, and insisted on eating them all for breakfast. We have not formed a tradition for St. Nicholas' feast day, but over the years, the kids have occasionally placed their shoes out to find small treats in them. We are doing kind of an all-out study of St. Nicholas today, so that might become more ingraine in our thought process. Our favorite way to celebrate is putting our shoes out the night before. Just discovered Catholic Icing and love it! Liked you on Facebook too. :) My husband actually dresses us as St. Nicholas and comes to visit our daughter as I am reading to her at night. He tells her his story and then fills her stockings before he leaves. She is always delighted and loves his visit as much as the stocking. We also read St. Nicholas books and make the Speculatius cookies.I've been looking for this movie recently and delighted to find it here. That would be "dresses up", not "dresses us", LOL. That would kinda take the mystery out of it. I "like" CCC of America on Facebook! :) What a great giveaway! I just discovered your blog and am in love. I really want my children to grow up knowing the Lord and your blog has tons of ideas. Thank you. We baked gingerbread yesterday to put in the shoes for St. Nick (along with carrot for donkey) and he left candycanes and chocolate coins and raisins. The kids were enthralled. My daughter gave out candycanes and one of the St Nick stories to her classmates at school. Our favorite St. Nicholas Day activity today was by far creating St. Nicholas holy cards! My 4 1/2 year old LOVED this. Here Saint Nicholas leaves gold coins each year, this year he also left pencils with the Guardian Angel prayer. Just liked CCC on facebook. Thanks for this giveaway, looks like a great one! St. Nicholas left chocolate candy coins in the childrens' shoes before they woke up this morning. They love it! The movie (on dvd) would be great! My boys put thier shoes out by the fireplace and when they woke up, there were st nicholas chocolate pops and cholcolate coins in them! I would love to win this!!!!!! We read a St. Nicholas book and watch a movie about his life and of course we wake up to shoes with chocolate coins and goodies inside. Well, we are new converts, so were new to this feast day. Last night, we watched the veggie tales St. Nicholas, and this morning we made a pic of St. Nicholas out of construction paper and went to the dollar store to pick out some toys to donate. I can't wait to come up with even more traditions in the years to come! I teach at a Catholic school and the children leave their shoes under their chairs when they go out for recess (in their boots) and come back to find a chocolate Santa and a personal letter from St. Nick! We don't have a family tradition for this yet. Hoping to start one this year! Thanks! I am from the South once moving to NE Wisconsin I heard about St Nick. Becoming Catholic helped more. This year we did not do much due to our plans being disrupted by a gas leak in the basement. Though a friend has a "mail box" on the mantel and her little girl left St Nick a letter and he wrote her one back. Already like ccc so I like the post about this give away. We set out stockings and shoes the night before, and St. Nick fills them with toys and goodies, including chocolate coins! Thank you for hosting the giveaway! This was our first year to celebrate St. Nicholas. My 4 year old and 2 year old put out there shoes and found gold chocolate coins, real money (2 quarters) and a new chapstick. They would love to see a video about St. Nick. We leave our shoes out, read a book about the true story of St. Nicholas, and then we go see Santa! We pray the Liturgy of the Hours. And leave our shoes by the door. My kids had gifts in their shoes this morning - chocolate St. Nicholas' made from santas from the store, candy canes, and chocolate coins - plus each had a book (saint bios for the older kids and a board book Bible for my toddler). We watched the Veggie Tales show about St. Nicholas for the first time, but we like the CCC version better - unfortunately someone broke it a couple of years ago and it hasn't been replaced. For the Feast Day we had to celebrate a Day early in my CCD class as we have it after mass on Sunday. I had them color a small icon picture of St. Nicholas and then glue it on cardboard to make an ornament for their tree at home. Then after reading to them about St. Nicholas I told them a surpise was dropped off for them. I had purchased some christmas baby socks and had put candy and a pencil in them for them. They were so excited both for the ornament and for the suprise they got. I didn't have time to do this yesterday, but in previous years, the kids found their usual chocolate coins in their shoes along with a clue that led them on a scavenger hunt. Each kid followed a different path and ended up finding a new book as their gift. I also do the chocolate St. Nicholas with a candy cane for a staff and red foil wrapping paper for a miter. I liked CCC on Facebook. We have this movie on VHS. It would be great to win the DVD! I like CCC on facebook. Thanks for the chance to win these DVDs! This year, we hung our stockings and St. Nick left us gold coins, new pajamas, and books about St. Nick. Living in a German-American town, we would go to the heritage museum for their annual wassail fest and visit with St Nick. They would explain his story and tell everyone what the kids in Germany would get from St Nick. My brother and I even got our pics in the local paper when were 7 and 5! I just liked CCC on facebook! We put letters to St. Nick in our window and he takes it at night and leaves us a treat. I like this on FB too! St. Nicholas fills our stockings with gold chocolate coins with images of St. NIcholas glue on them and he gave our daughters silver coins with their patron saint along with a Miraculous Medal. We also drop off our needy family gift at the church on this day in remembrance of the generosity of St. Nicholas. Our daughters leave their shoes out on the eve of the Feast of St. Nicholas. 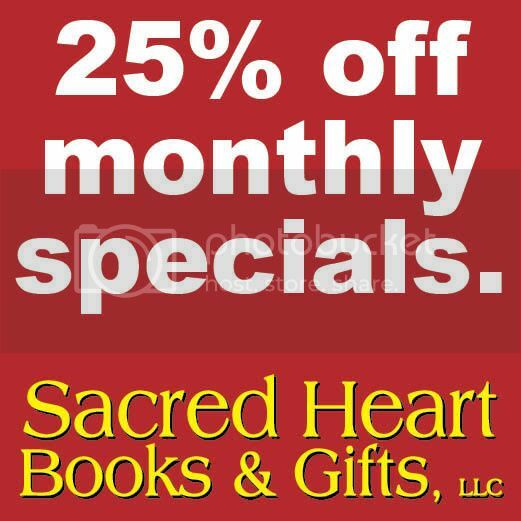 This year they each rec'd 'gold' chocolate coins, a saint coloring book, a daily spiritual companion book with a prayer & saint info and a place to write birthdays & anniversaries, and 2 bookmarks from Illuminated Ink to color. They also rec'd a card game (joint gift). We love to play games at our house, so we receive new games for St. Nicholas Day & CHRISTmas that we enjoy playing throughout the year. I like CCC on Facebook...and you too :o) Entry 2 God bless! I "like" CCC on facebook. The shoes are big here too! if we do nothing else we put out our shoes! The older kids always remind the younger ones about the apples, candy coins, and small gift. Its one tradition that will never be forgotten! thanks for having the give-away! Opening up our Advent drawers each day! We leave our stockings up all day and the kids continue to put presents in them throughout the day. We enjoy candy cane hot chocolate and play a matching game with pictures of items significant to St.Nicholas's life. Okay, I just "liked" CCC on FB! Thanks! The kids put their shoes out by the bedroom doorway and in the morning there are chocolate coins and Santas and a saint book or CD or movie. This year we went to Mass in the morning and the kids made miters and croziers to turn the choc Santas into St. Nicholas. We also read a story about St. Nick and prayed for his intercession for some of the children in our lives. Email at tinagirod@comcast.net. We host a big St. Nicholas party for the homeschool group! Then we put our shoes out for treats on the Eve of Dec. 6th. Liked on FB - thanks, CCC!! We like to wake up to shoes full of gold chocolate coins (This year with pictures of St. Nick pasted to them, thanks to Shower of Roses). We also have a St. Nicholas statue in a place of honor for the day/season. I liked CCC on Facebook! We love to celebrate St. Nicholas Day and did so in many ways this year! 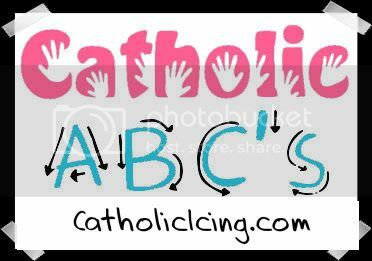 I liked on FB... we used to watch the CCC videos in my Catholic elementary school, in the 80s/early 90s... such good memories! I laid out our plans, which were mostly met, in a blog post on Monday. Please enter us in the give-away. We love to have a special breakfast, decorate our house with lots of saint nicholas statues, put our shoes out and watch the veggie tales Saint Nicholas movie. We went to a playdate where we found our shoes with gold coins, tangerine and candies. We talked about St. Nicholas and colored his picture. I do want to see the Veggie Tales movie on him. Our boys put their shoes outside the door the night before and St. Nick brought them little surprises. Then we watched the Veggietales St. Nicholas movie! First of all, I LOVE this blog!! I just found it tonight! Secondly, we celebrated St. Nicholas' feast day by putting our shoes out and receiving gold coins and pj's (which we'll then wear on Christmas Eve)! And I liked CCC on facebook! The letters were such a hit. I can't believe how much they treasure them. I didn't know anything about him until today. Thank you for sharing this. 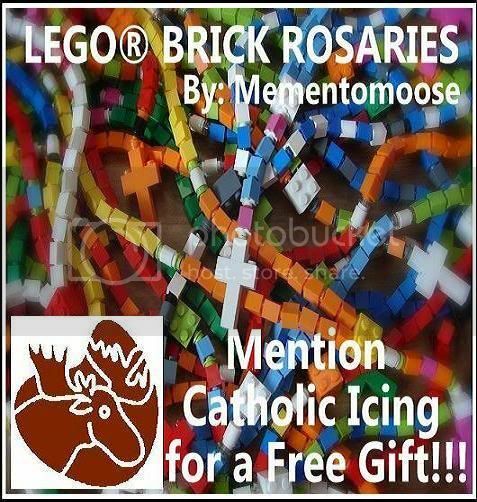 I have a Child of Mexico d in my Catholic Classroom and I can share this with her and the others. I will bring this to our staff morning prayers to share so we can offer it to the other Mexican children as well. The kids put their shoes out on the eve of St. Nicholas Day and they wake up to chocolate coins. st.nick left us wrapped books about him and gold coins in our shoes! i liked this and juan diego on facebook too! We do St. Nick shoes, read a story and make a star with rings to count down until Christmas. We watched the Veggie Tales St. Nicholas movie (free instant play on Netflix! )and found wee wooden dolls and candy canes in our shoes! In the past on the eve of St Nicholas's feastday all children place their shoes at the foot of our antique church organ. After they go to bed I sprinkled them with glitter and tinsel. In the morning they discovered beautiful Catholic books and chocolate gold coins through-out their shoes. We would then have a St Nicholas tea-party, with lovely red and white treats. Our table is decorated with a variety of St Nicholas images scattered through out the tableware and tinsel. I also had to add; we also watched EWTN which has shown this wonderful childrens movie on St Nicholas many times. We would read the life of St Nicholas and the children would do St Nicholas craft which is what we used to decorate our table. It's such a beautiful feast day and one that the children can learn much about the gift of giving. We did a St. Nicholas craft and put the shoes out for St . Nick to fill. I "Like" (well actually love) CCC on Facebook under "Tracy Bua Smith". Like most people, we wake up and find that our stockings have been filled! My kids are still young, but I remember watching this on VHS when I was younger and I look forward to passing that tradition on to my children. We have yet to find our tradition. I read through your comments and got a lot of great ideas. I just "liked" CCC on facebook. Thank you again! We celebrate St. Nicholas's Feast Day by reading about him on his Vigil and then the children set their shoes by the foot of their bed so that they will be filled with chocolate coins during the night. In the morning, the children get their candy from their shoes, say a prayer in thanksgiving to St. Nicholas, and ask him to watch over them throughout the day. I just "liked" CCC on Facebook. Thank you for having this giveaway! My daughter is 3 so this is the first year we celebrated. Chocolate coins in her little shoes and a new book.